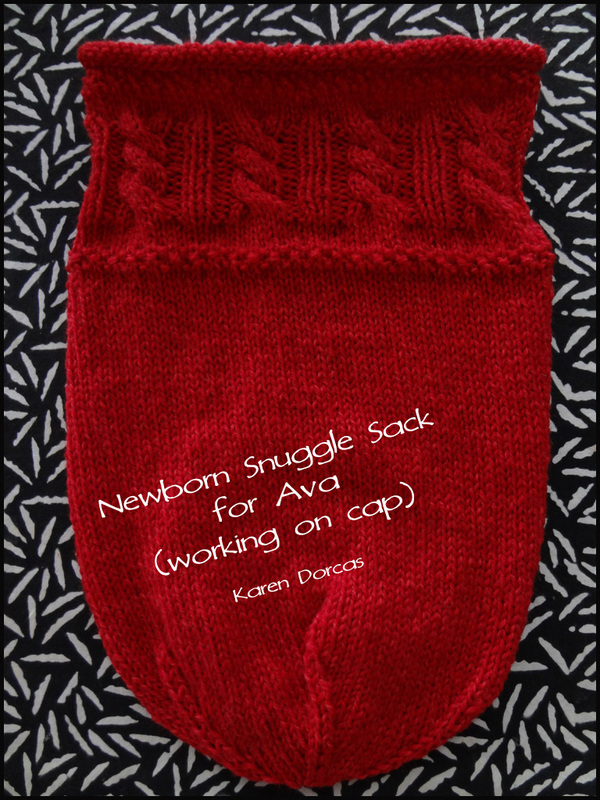 Had so much fun finishing the snuggle sack; but thought it prudent to leave the double point needles in my checked baggage. Therefore, will begin the cap in Desert Hot Springs. You're in Desert Hot Springs for the weekend? That's on the other side of the San Jacinto Mountain from me. Have fun! Tomorrow should be sunny. How sweet! And with the matching cap it will be adorable! How lovely I had not seen this before!AriadnefromGreece! That is the cutest thing ever! What great pics you could have with the baby all snuggled in. Enjoy your vacation and warmth! What a lovely, thoughtful project! what a great idea! !It's lovely!!! As in Desert Hot Springs, Ca...I lived near there once apon a time..Enjoy! What a great idea. I wish I had seen this prior to my nephew's birth in December. 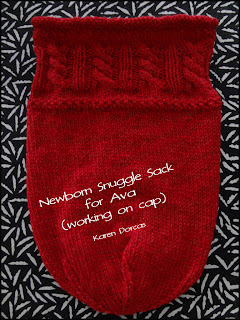 Maybe future grandchildren will have to benefit from a snuggle sack. Beautiful work on the cabled top. This is so sweet. It's the first time I've seen one! I love the cable stitch at the top.